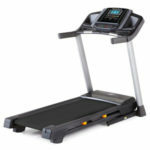 The NordicTrack T 6.5 S treadmill is a very similar model to the ProForm 520 ZN. There are several differences between the two; for example, the NordicTrack model doesn’t have a cooling fan, and offers two extra on-board workouts. But overall they share the same spec range, however, this particular treadmill is a couple of $100s cheaper than the ProForm (at least for now). Needless to say, this NordicTrack treadmill model features a steel-made frame. The fully assembled machine is actually quite heavy, weighing over 200 lbs. However, this weight plays an important role in its overall stability. 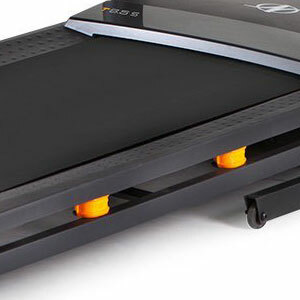 And speaking of stability, the front part of the treadmill rests on two rubber pads, while the rear of the deck features two adjustable stabilizers with, also with rubber pads. The rear part of the front base frame integrates a set of wheels, which facilitate the transport of the assembled and folded machine. As we’ve just mentioned, this treadmill features a folding design. The folding mechanism consists of a telescopic EasyLift shock, which assists with the lifting and unfolding of the deck. With the deck folded up, the machine’s length is reduced to approx. 1/3 of its total length. The treadmill’s assembled footprint is not extremely wide though. However, this machine isn’t exactly small either. It takes approx. 67.5″L x 35.7″W (172 x 89 cm) of floor space, therefore, prior to acquiring it, make sure you have the usage space available for it. The NordicTrack T 6.5 S treadmill features a solid deck, able to support users up to 300 lbs (136 kg), and in running workout routines, not just for walking or jogging. It integrates the FlexSelect cushioning system, which consists of two suspension cells on each side of the deck. The firmness of these suspension cells is adjustable. You can rotate them in order to increase or decrease the overall firmness of the deck. The deck’s cushioning system can reduce up to 25% of the running impact on your joints. 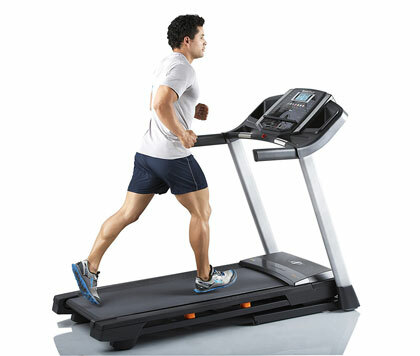 This treadmill is equipped with a heavy-duty one-ply belt, which offers a running surface of 55″L x 22″W (140 x 51 cm). This means it can accommodate comfortably users up to 6’2″ – 6’3″ (188-190 cm), for running workouts. Of course, if you’re taller you’ll still be able to run on, but in this case the treadmill may feel a bit small. Also, the deck uses 1.9″ (5 cm) crowned rollers, with sealed ball bearings, for a superior grip on the tread belt. The NordicTrack T 6.5 S treadmill is equipped with an automatic lift system for the deck, which provides a total incline of 10% (approx. 8°). It’s not much compared with the 30-40 degrees that some of the commercial grade treadmills can provide, but still, it offers the possibility to intensify your workouts. Differently put, running at 8 MPH for example, with the deck setup at maximum incline, a non-professional runner may not last more than a couple of minutes. Since the incline is motor-powered, you can only adjust it from the console. Also, some of the on-board workout programs involve the machine’s incline system, and will adjust incline automatically, depending on the current workout segment. The incline adjusts in increments of 1%, with a total of 10 incline settings. When it comes to step-up height, the running surface stands at approx. 8″ (20 cm) above floor level, at 0% incline. At 10% incline, the front part will raise by a few inches, but basically you’ll be situated on the deck at the middle, not all the way at the front. Differently put, the overall elevation that you will get by running at maximum incline should be approx. 12″. So, in conclusion here, the ceiling height in the room where the treadmill will be in use should be higher than your own height, plus about 15″ (38 cm), in order to avoid any issues. 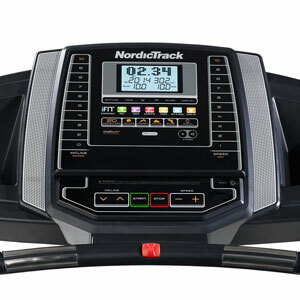 The drive motor equipped on this NordicTrack treadmill is a 2.6 CHP model, built to withstand long duration workouts, without choking or overheating, even if the user is close to the maximum supported weight. It features a small flywheel for extra stability and smoothness. It supplies speeds up to 10 MPH. Speed can be adjusted in increments of 0.1 and 0.5 MPH, which is quite a plus, as you can easily find the most appropriate pace for your jog or run. Evidently, since it’s an electric motor, the treadmill requires to be connected to a power circuit. It actually requires a 120-v, 15 amp circuit. It comes with a power plug not an adapter, and a 4 ft. long cable, which plugs into the machine close to its front base. The console supplied with this treadmill is a mid-range one. It integrates several amenities, such as a media holder, a sound system and two accessory holders. However, it does not integrate a cooling fan, and it’s not telemetry enabled (in other words, it cannot read pulse through a chest strap transmitter, only through the sensors built-in the front handlebars). The sound system renders decent quality sound. It consists on two speakers, one on each side of the console, and it’s compatible with most MP3 players, smartphones and tablets. The console features buttons for volume adjustment, but you can also adjust volume from your device. The console is equipped with a 5″, backlit display, with large digits, easy to read. It shows time, distance, speed, incline, pulse and calories burned. Distance can be displayed in miles or km, but there’s also a track display function, which shows distance in laps of 1/4 miles, indicating how many laps you have completed. Speed can be tracked in MPH or km/h. There are goal setup functions for time, distance and calories, but the console also makes available 20 pre-set programs, which automatically adjust speed and incline. On top of that, the console is iFit compatible. You can purchase an iFit module, insert in the console, and connect it via Wi-Fi with your laptop or tablet, in order to use any of the iFit workout programs, video apps, to use running tracks from Google maps, and to directly monitor your workout progress. The iFit module and iFit membership are not included with the treadmill though. Overall, the machine’s console is easy to operate. You can adjust incline and speed gradually from the arrow and +/- keys, or using the quick adjustment keys on the side of the display. The on-board programs have their own keys by category. iFit apps also have direct keys on the console. And finally, there are Start and Stop keys which give you the possibility to put your workout on hold and resume if it’s the case. This NordicTrack treadmill is far from being difficult to assemble, task which shouldn’t take more than one hour. Its deck and motors come already assembled and attached to the front steel frame part. All you need to do is attach the folding leg, the upright posts and the console connecting the wires. A hard copy of the manual is supplied with the box, and provides clear assembly instructions. An Allen wrench required for certain screws and for adjusting the belt is included, but you’ll also need a Phillips screwdriver for assembly. For maintenance, even though the belt is pre-lubricated with high-grade, industrial lubricants from the factory, after a while it may require extra lubrication. Other than that, you just have to keep the running belt clean, free of dirt, textile fibers or other objects that might be dragged under it and get caught in the motor. Console is not telemetry enabled, and does not work with HR chest strap transmitters. Heavy frame, requires two people to carry and assemble. The NordicTrack T 6.5 S is a treadmill machine designed for residential use. It’s actually an entry level running treadmill, great for anyone who wants to undertake cardio, interval and weight loss workouts, running a couple of miles per day. However, it may not be the best choice for professional long distance runners, as its maximum speed is only 10 MPH. 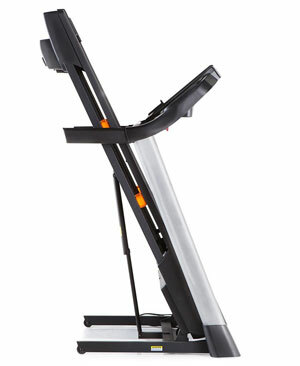 It offers a decent range of on-board workouts, it has automatic incline, and it’s iFit compatible. It’s a machine with a solid construction, an excellent choice for home use as it has a folding design, offering great value for the price.